Principal Cast : Matthew McConaughey, Jessica Chastain, Michael Caine, Anne Hathaway, Wes Bentley, McKenzie Foy, Casey Affleck, Matt Damon, John Lithgow, David Hyasi, Leah Cairns, Topher Grace, David Oyelowo, William Devane, Ellen Burstyn, Voices of Bill Irwin and Josh Stewart. Synopsis: A team of explorers travel through a wormhole in an attempt to ensure humanity’s survival. Boldly going somewhen noone has gone before. When Interstellar was released into cinemas, there came with it the inordinate expectation of a new Christopher Nolan film; the man gave us Inception, The Dark Knight Trilogy and Memento, so any film with his name attached as director automatically (although invariably irretrievably) came with weight of fanboy and critical desire for another mind-trip, another masterful venture into his personal elucidation on whatever narrative her desired. Interstellar, by many accounts, is largely mediocre. Critical appraisal has been, and I say this without sneer, mixed at best. Controversy surrounded a supposedly poor theatrical soundmix that saw much of the dialogue overpowered by Hans Zimmer’s thundering score, which only served to cause people to wonder exactly what the film was on about at key moments. I was initially excited to go see this, but after a number of reviews from people I trusted came out, all giving it a bit of a “meh” rating, I decided to wait for the at-home version and give that a shot. So is Interstellar the “mediocre” film event many scored it as, or is it a hidden masterpiece outweighed by sheer expectation, a level of cinematic brilliance only a few films have ever achieved? Space films of a certain prestige have become fewer, and further between, in the years since Stanley Kubrick’s game-changing 2001: A Space Odyssey. About the only other film to even attempt to produce a “thinking person’s” sci-fi epic is Solaris (both versions), with almost every other film set in space usually filled with explosions, visual effects, and menacing aliens. Intellectual science fiction, speculative sci-fi, is a rare breed indeed to find floating through the megaplexes, least of all a three hour monster directed by a man who’s name alone above the title can pull a crowd on its own. Considering how few of these kinds of films we get, and irrespective of your opinion on the final product, kudos should be given to both Paramount and Warner Brothers for producing/distributing it, and Nolan for attempting it just because it needed to be done. Referencing Kubrick’s 1968 magnum opus within this review is telling, because Nolan’s Interstellar tries to accomplish many similar things. As an inter-generational film, Interstellar’s broad scope and humanistic reach, delving not only into the technical aspects of space travel, but how time and space impact humanity, are echoes of Kubrick’s masterpiece of story and imagery. Although, whereas 2001 become a truly cerebral head-trip (some would say mind-f@ck), Interstellar remains rooted in a more straightforward narrative, even when tackling the “big issues” of our existence on this tiny bit of rock orbiting the sun. Yes, comparisons between Interstellar and other intellectual space films are inevitable, largely due to the fact that a lot is expected of Nolan’s reach into the subject. Similarly to 2001, Interstellar is set in the future (although here the date is less specific), and a theoretical crop blight has forced society to return to a familiarly agrarian method of survival. However, Earth is soon to become too inhospitable to support life, meaning the exploration of space, and “strange new worlds”, in search of a viable replacement, is undertaken with all haste. Cue Matthew McConaughey’s NASA pilot character, Cooper, who makes the decision to leave his family and travel into space on a virtual one-way trip to locate a replacement Earth. Interstellar becomes less a straight up movie and more a rumination on love, life and loss, all cocooned in the cold embrace of deep space’s empty pathways. The film’s screenplay, written by Nolan and his brother Jonathan, is brave in its endeavours to extract some large-scale philosophy discussion, yet, it ultimately fails through sheer weight and a lack of decent character support to salvage it beyond merely “meh”. 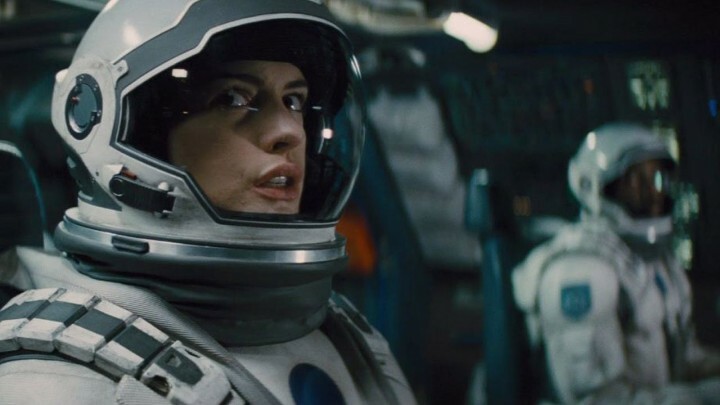 With its evocative themes, Interstellar’s brave journey into space is more often ungrasped as a narrative whole, even when asking its rock-solid cast to deliver “moments” that don’t resonate as powerfully as Nolan probably intended. Interstellar represents a director at the height of his powers: the cast he’s assembled here are some of the best in the business today, and although he doesn’t ask all of them to deliver Oscar-worthy performances, nobody puts a foot wrong. 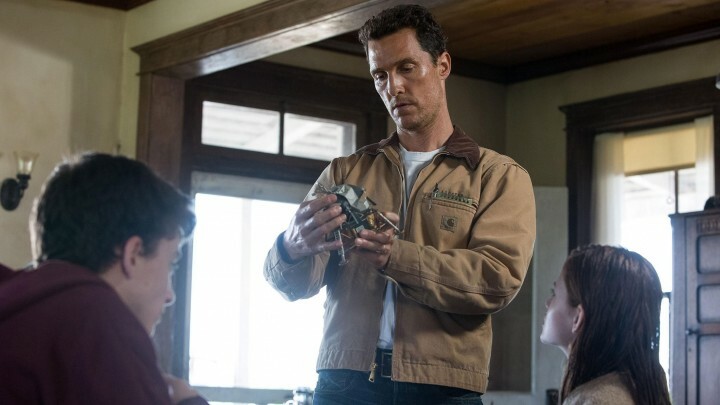 Mackenzie Foy, Jessica Chastain and Ellen Burstyn (the latter of whom primarily “narrates” this film as a flashback) portray the same person – McConaughey’s daughter, Murphy, left behind as he blasts off into space. Murphy represents the film’s “why we fight” subplot, the motive for Cooper’s leaving our planet for the distant stars (through a wormhole theory) in order to save his daughter (and us, by proxy). Foy’s innocence gives way to Chastain’s less virginal appraisal of the scenario, with a subtle two-pronged viewpoint as to the value of survival intermixed with the requirement for it above all else. Chastain carries the more cerebral aspects of the film, as she wistfully remembers her father in his absence, and an actress of her calibre certainly gives the character some impetus, but the film’s shift between space and home isn’t handled particularly well – when Nolan spends time on Earth, I wanted more of McConaughey in space, a factor the film struggles to overcome. McConaughey gives a terrific performance as Cooper. He’s the “hero” of a film without heroics; it’s a matter of survival, not heroism. Cooper’s duty to his family, to try everything he can to save them, is what catapults him into space (he just happens to be an ex-NASA pilot, naturally) and from there he naturally second-guesses himself (as does his family back on Earth). 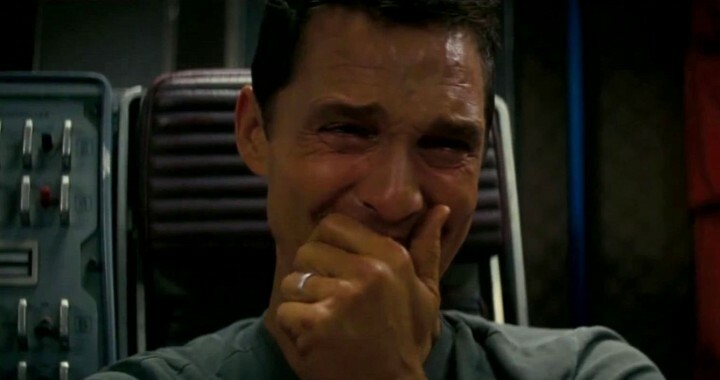 This emotional wrangling supports a lot of the film’s second act, and provides a lot of grist for the “action” third, but it’s more thanks to McConaughey’s performance than anything either of the Nolan’s bring to the movie. Perhaps the best moment of the whole film is an utterly heartbreaking scene in which Cooper watches 23 years worth of video recordings from his children as they grow, a wrenching realisation that by the time he might return to Earth, they could all have long since passed. And that he’s missed out on their lives. 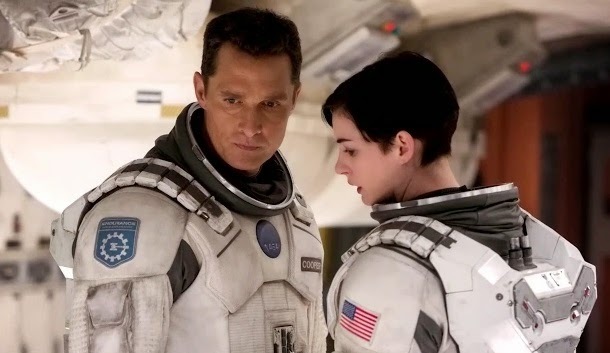 Accompanying McConaughey’s Cooper into space are three NASA astronauts, Amelia Brand (Anne Hathaway), Romilly (David Gyasi) and Doyle (Wes Bentley), all of whom provide the mission with a bit of extra width emotionally. Hathaway’s track-record of deep emotional roles is noted, but I kinda felt here that she struggled to endear the motivations of her character to the audience. I think she lacked…. believability, if that’s the right word. I’m not one to call “miscasting” as a critical note very often, but I think Hathaway might have been wrong for the role (plus, she looks too young, as does Bentley, if I’m honest). In saying that, her performance is solid from an acting perspective, I just think it lacked a certain conviction the part needed to counterweight McConaughey’s. Gyasi’s Romilly, I’m sorry to say, felt a tad tokenistic – he’s a black man in a (mainly) white film – and his part lacked a genuine arc or purpose other than, more often, Mr Exposition. And good on him for stealing exactly the same description about wormholes as was featured in Event Horizon. Ergh. About all that was needed to complete the cliche was for him to wear a red shirt. Smaller roles to Michael Caine, as the NASA Professor John Brand (Amelia’s father, no less), and Casey Affleck, as Cooper’s son Tom, as well as minor cameos to David Oyelowo and Topher Grace, and a patriarchal figure in John Lithgow (as Cooper’s dad), provide some context to both humanity’s plight and it’s eventual salvation (maybe). It’s a solid cast, but as already stated, those “left behind” on Earth aren’t required to do little more than stare wistfully at the sky and hope that everything will turn out okay, parallel to trying to stop the Earth’s blight from continuing on and causing humanity’s extinction. Although the majority of the film is grounded in realism, or at least a realism most of us will recognise, the film’s two “fictional” characters, a pair of monolithic robots names CASE and TARS. 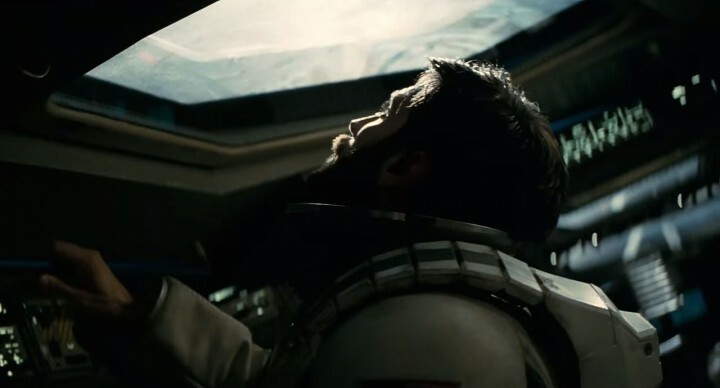 They provide a kinda HAL sense of calm throughout the tense goings-on of Interstellar’s time-warping narrative. Voiced by Bill Irwin and Josh Stewart, the twin robots feel like actual characters instead of orchestrated CG avatars. It’s a pleasant surprise to find robotic creations so perfectly integrated into a narrative, and into the world Nolan has created. And late in the film, Matt Damon shows up as one of the first astronauts sent to search for habitable worlds, Doctor Mann. Damon’s appearance feels like stunt casting, but he’s solid and delivers a fine performance. 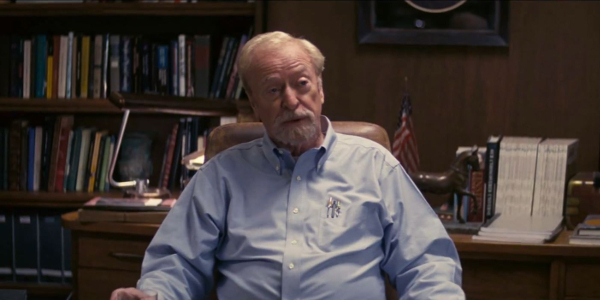 If nothing else, Interstellar’s endeavour cannot be questioned. Nolan’s gone all out here trying to give us a human adventure, the likes of which we’ve never seen. Nolan isn’t afraid to ask the big questions (although his line of questioning probably isn’t as articulate as he seems to think it is) and although this film isn’t quite as brave with the answers, faulting Nolan and his team for trying is simply nit-picking. You don’t see Michael Bay making a film like this. (!) From a technical standpoint, it’s one of the most gorgeous films of the year, and I mean that both in cinematography and for sheer visual impact. A noted cinephile such as Nolan is always going to demand the A-game from his production team, and Interstellar delivers on all fronts. The space flight itself, through wormholes and across the galaxy is simply stunning, vistas of stars, spectral novae and other effluvium of spatial produce enhanced through fantastic CG and stunning design. DP Hoyte van Hoytema, nominated for an Oscar for his work here, delivers a magnificent visual feast. One of the film’s biggest controversies came with many audience members complaining that Hans Zimmer’s score, most of which is a massive organ-driven work simulating some kind of “holy mission” mantra throughout the film, overpowered much of the dialog during important stretches of the film. Now, I can’t speak for the cinematic experience, but I’m pleased to report no such issues on my copy of the film. In any case, Zimmer’s score is indeed powerful, and the music is among the very best (and most traditional) of his long career, although I will say that if you’re not a fan of organ music, you might find Interstellar tough going during its latter stages. There’s a lot of it, a lot of the time. Kudos for Zimmer in giving me a score to remember, at least. Interstellar makes a big thing out of small things; life, love, exploration and the desire of our species to survive. Okay, so not small things, but in its quest to broach tough questions on these topics, Nolan can’t quite make things click. There’s moments of breathtaking brilliance here, yes. There’s some nice sequences that will excite and elicit the requisite “oohs” and “ahhs” from the audience. Trouble is, the core of the film doesn’t come without its share of difficulties. The whole “father off in space to save the world” story is hard to make count when the relationship between family and distant father isn’t as solid a foundation as a three hour film might need, but it’s not through the actors performances that this problem evolves. 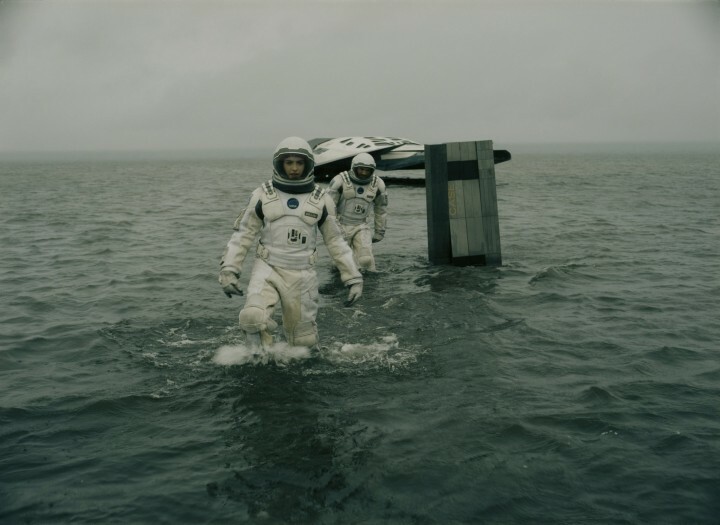 Interstellar is the kind of film people should make more of; it takes us on a journey within moreso than without, and asks some pretty fundamental questions about where we as a species are likely to head. In and of itself this isn’t a bad thing at all. It’s just a shame the film’s thunder and fury add up to less than the sum of its parts. 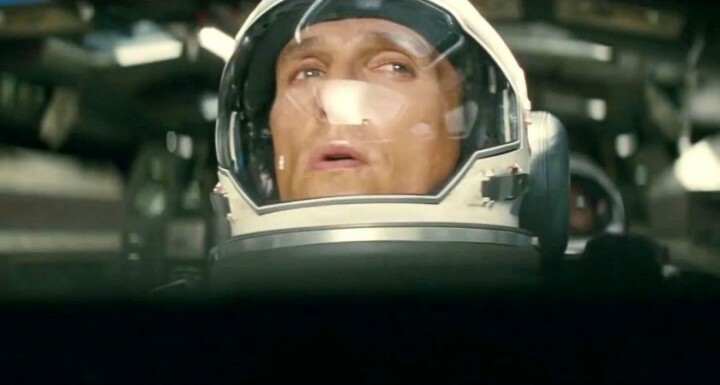 Interstellar is essential viewing, it’s just not as effective as it might have been. Eh, this was a huge disappointment for me. While I really liked Anne Hathaway in it, the whole film fell flat for me. Thanks Jack. While it didn't achieve all it set out to, there's no faulting Nolan for at least trying.